Greater Mankato Growth works tirelessly to both advocate for the marketplace and raise the visibility of our region amoung policy-makers. Here you will find information on a series of policy issues that are of interest to greater Mankato Growth's members and our regional marketplace and learn how you can become engaged on issues critical to your business. Our regional transportation network is a vital economic lifeline that countless businesses and individuals rely on for the movement of goods, as well as themselves and their families. As businesses make significant investments and our region continues to grow and become an even bigger contributor to the state’s economy, we expect our public partners to do their share and make the necessary investments in infrastructure. That's why Greater Mankato Growth strongly supports the expansion of Highway 14 to four lanes from New Ulm to Rochester. 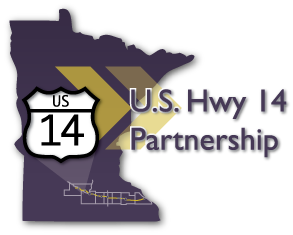 Highway 14 must be a top state priority to ensure that adequate infrastructure exists in Southern Minnesota to enable future economic opportunities and improve safety along the corridor. Letter on behalf of Greater Mankato Growth recommending the Highway 14 projects needed to complete a consistent four-lane corridor from Rochester to New Ulm for Corridors of Commerce program funding. Letter on behalf of Greater Mankato Growth providing comments to the Minnesota Department of Transportation regarding their draft Minnesota State Highway Investment Plan respectfully requesting that the state prioritize completion of the four lane expansion of U.S. Highway 14 from Owatonna to Dodge Center and North Mankato to New Ulm. Letter on behalf of Greater Mankato Growth to Governor Dayton and Commissioner Zelle respectfully requesting the inclusion of the four lane expansion of U.S. Highway 14 from Owatonna to Dodge Center and North Mankato to New Ulm in the 20 year State Highway Investment Plan currently under review. To advance a key community priority, Greater Mankato Growth testified on several occasions before the Legislature to request that they prioritize completion of the four lane expansion of Highway 14 . Jonathan Zierdt, President & CEO of Greater Mankato Growth testified before the Senate Transportation and Public Safety Committee. The organizations below may provide you with an opportunity to earn more or get involved various transportation initiatives. Greater Mankato Growth would like to encourage the business community to serve as a voice for your business, industry and marketplace by applying to serve on a state or local board, council, commission, task force or agency. Serving at a state and local level can give you the chance to shape the future in areas and fields where you have passion and experience. Let's work together to ensure Greater Mankato businesses continues to be represented in state and local government. The Minnesota Secretary of State acts as a clearinghouse for public openings on state agencies. The Secretary of State announces vacancies to the public, refers applications to those who make the appointments, and maintains records of the memberships on the various state boards and councils. The Secretary of State publishes a monthly announcement of vacancies. Besides the vacancies, it lists the qualifications for membership, the functions and duties of the agencies, and the application deadlines. Click here to learn more about serving on a state board or commission.